The 2000-year-old German city of Cologne is famous for its rich artistic and architectural history. And today, it has enticed us with a very contemporary and picturesque residence, which boasts of stylish interiors and refreshing exteriors. Simple yet trendy lines define the structure of the abode, while the aesthetically planned garden and lawn offer sheer outdoor pleasures. The rooms are minimalistic, elegant, soothing, and embrace the outdoors with gusto. 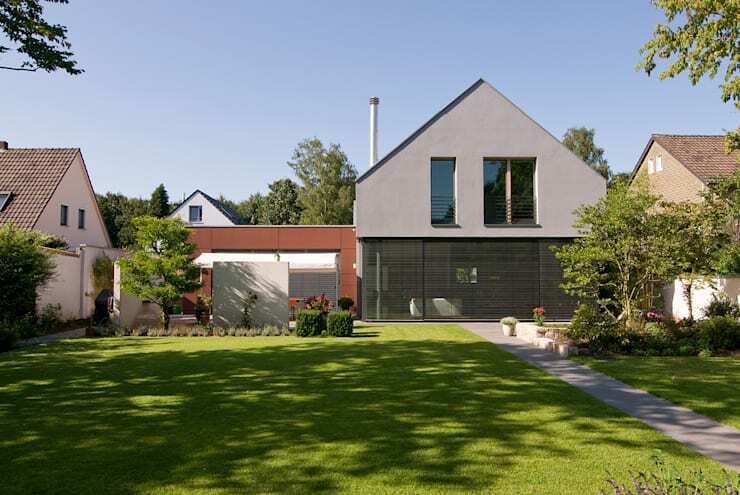 Rendered by the architects at Wirges Small Architects, this house will give you tons of ideas for sure. With a sloping roof, large glass windows, and soft pastel hues, the house looks modern as well as quaint, when viewed from the street. Pretty white pebbles, neatly trimmed hedges and lush green patches come together to create a lovely front garden, while a single stately tree subtly separates the abode from the garage. After sunset, the lone but verdant tree we saw before is cleverly illuminated for a magical scene of sorts. 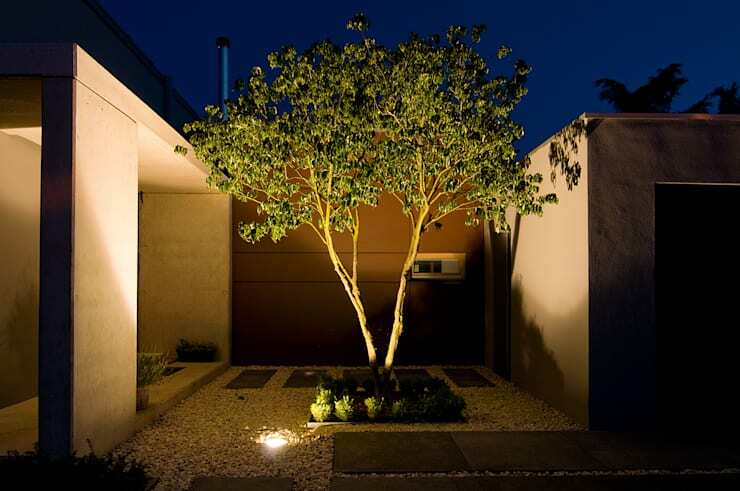 White pebbles and sleek, grey pavers add sophistication to the ground, while the neutral hues of the facade and garage act as a perfect canvas for the green of the tree. A perfectly maintained lawn, streamlined hedges and elegant trees join hands in the backyard for an atmosphere of calm, positivity and freshness. The neat lines of the building, generous use of glass on the backside of the ground floor, and the play of light and shade on the greenery paint a pretty picture. 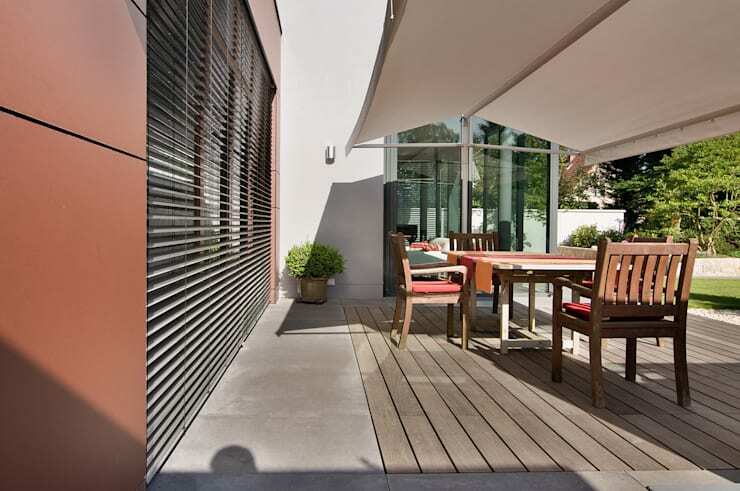 A delightful backyard is incomplete without a stylish and cosy open air dining arrangement. So this residence too flaunts sturdy but chic outdoor seating for those times when you want to enjoy a breezy lunch, dine under the stars, or simply sit and soak in nature’s beauty. 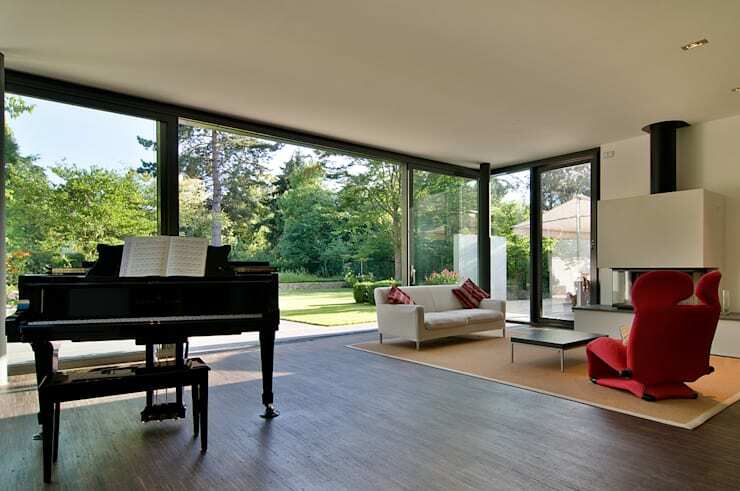 We simply adore how the living area opens up to outdoor bliss through large sliding glass doors set in neat black frames. The view is breathtaking and the doors allow ample ventilation too, when left open. An elegant piano waits for you to indulge in your musical passions, while the modern fireplace on the other side promises warmth. The red, quirky and futuristic chair adds a dash of fun to the predominantly white space, along with a sleek couch, a simple coffee table and straw-coloured rug. The dining space merges with the living area seamlessly, offering diners stunning views of the backyard. 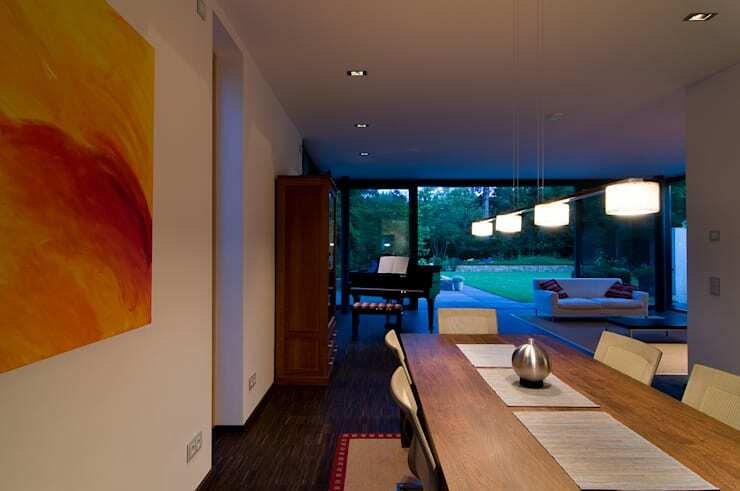 Cubic pendant lights glow soothingly and elegantly over the setting, while a vibrant painting cheers things up. 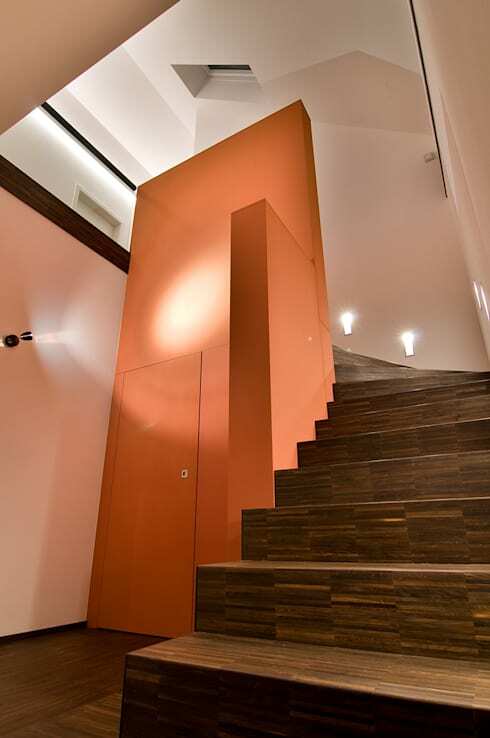 A muted but warm shade of orange on the wall and balustrade edging the stylish wooden staircase, adds oodles of personality to the space. A sleek door beautifully conceals storage space under the stairs, while recessed lights brighten up your way to the upper storey. 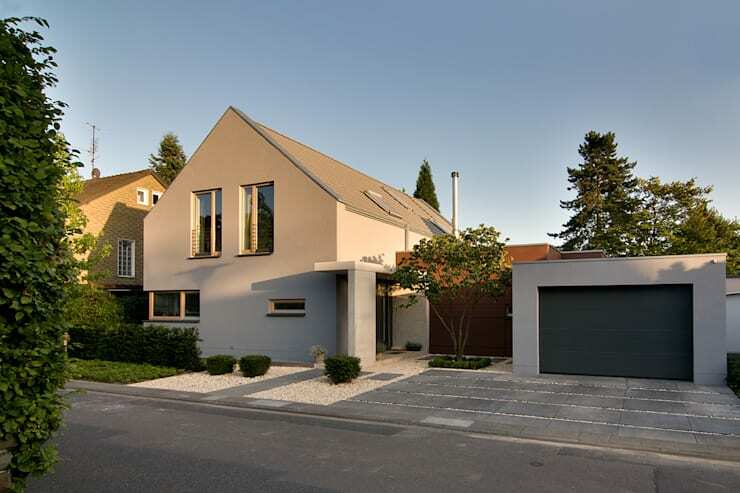 Sleek and trendy designs, dashes of quirk and vibrancy, and an unabashed love for the outdoors, make this German home a delight. Here’s another tour for more ideas - This Home Is A Bold Black Beauty.